Automatic Cable Wire Crimper Crimping Tool Stripper Self Adjustable Plier Cutter. Self-Adjusting with cushion handle grip. Side insertion of wire for ease of use. Integrated wire cutter and crimping jaws. Heavy duty construction with hardened steel blades for outstanding long term performance. For striping the plastic / rubber insulation on single / multiple cables and wires of 0.5 - 6mm. Stripping diameter can be adjusted automatically for different wire cross sections. For copper and aluminum wires, multiple strand up to 6mm, single strand up to 0.5mm. 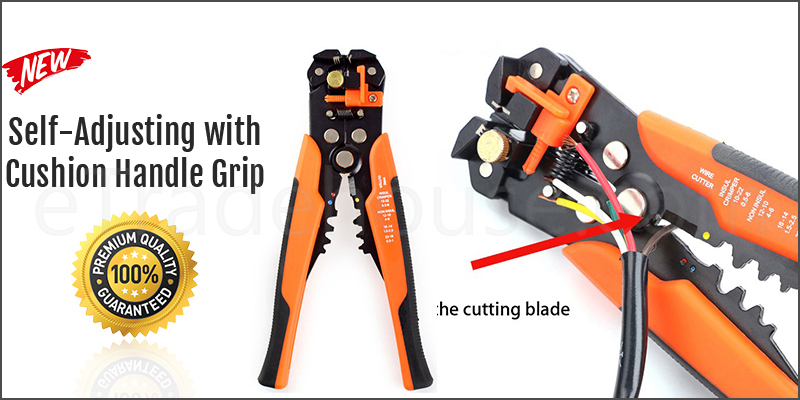 Automatic self-adjustable cable wire crimper plier cutter.